This past weekend, Team Sporks competed in the Trio category at the Six Hours on the Lake endurance mountain bike race held at Harris Lake County Park. The individual results are not yet posted, so we're not sure exactly where we finished for this particular race (although we believe we came in second). 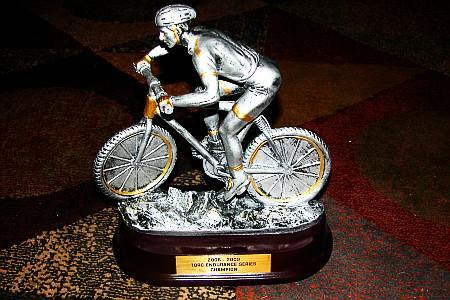 However, after participating and posting decent results in all three races in the series (where we also served as volunteers for the events twice), we ended up with enough points to win the overall Series Championship, and each member of the team was awarded one of these lovely trophies. Many thanks to my teammates, Pryde and Steve - you guys rock!